Cover the sort of ground you just can’t cover on public transport on this action-packed door-to-door guided tour of Ninh Binh. 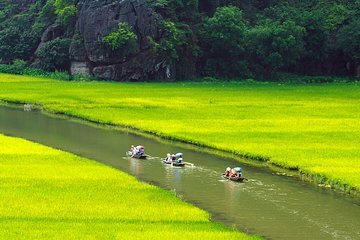 Tour Hoa Lu, Vietnam’s capital 1,000 years ago, feast on a buffet lunch, enjoy a sampan ride through the beautiful karst landscape of Tam Coc, then cycle through the paddy fields. Book through Viator to enjoy a free soft drink with lunch. Great tour and our tour guide Tom was great. Highly recommend this trip just watch out for the mid part of the oat ride they will try get you to buy things for the rowers dont feel pressured to do this as they will also ask for a tip at the end. Otherwise I enjoyed every moment of this one.